Apparently subtle, heathered grays in home décor aren’t going anywhere…just yet. Last year, Benjamin Moore & Co. named the highly saturated red Caliente its Color of the Year, and the Pantone Institute just announced the bright and beautiful Living Coral its hue of the moment for 2019. 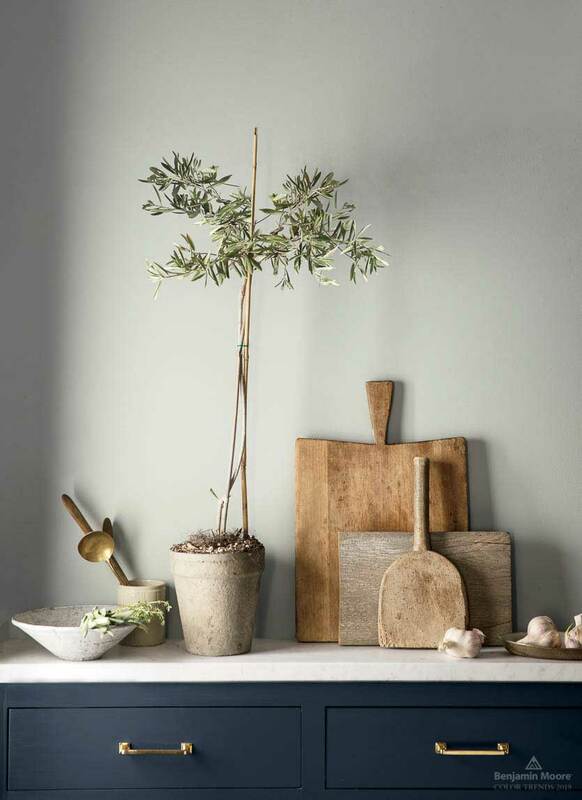 By making Metropolitan AF-690, which has been part of the Affinity Color Chart for three years, the 2019 Color of the Year, Benjamin Moore is back to making a “serenity now” statement in paint color that’s both understated and versatile. The professionals at Debsan The Decorating Store, in Natick Center, which boasts every Ben Moore paint color under the sun, were surprised by this nod to the neutral, as they’ve seen the popularity of grays wane a bit of late and color on the comeback trail. Perhaps the key is the nuanced shade’s versatility, as well as its state of calm. 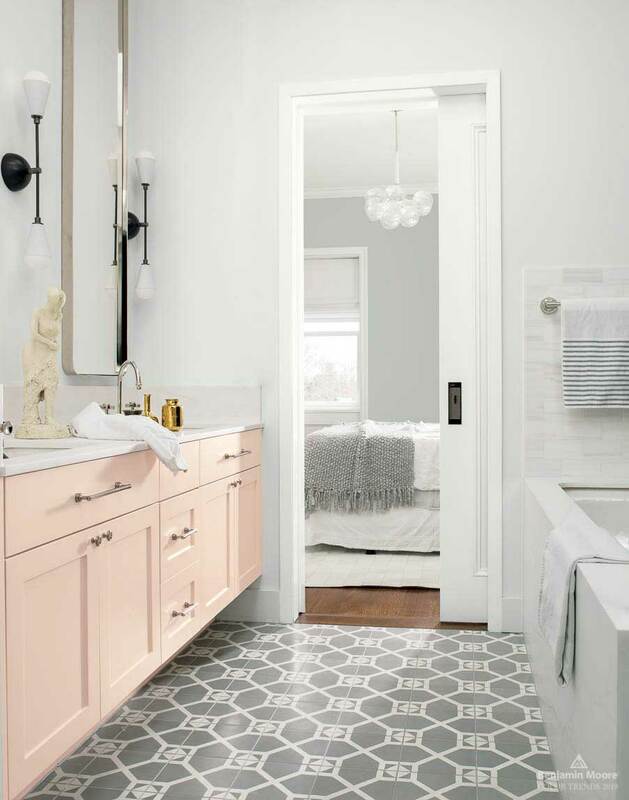 Ellen O’Neill, Creative Director of Benjamin Moore & Co., has this to say about the company’s color choice: “Metropolitan AF-690 emanates nuance, harmony and extravagant ease. Always adaptable, it softens to matte or shimmers with sheen. It's neutral. It's understated. It just is. This is color, off-duty." There is no denying it plays well with others. When creating a color palette for a room, Benjamin Moore suggests pairing it with Head Over Heels, a whispered pink blush (shown above); the regal and rich Hale Navy (below); a soft and citrusy Lemon Chiffon 932; or even Mustang, a warm chestnut tone. President and Owner Ben Greenberg of Debsan doesn’t recommend Metropolitan as a stand-alone hue. He suggests using it alongside heavy doses of color on fabrics, art, accessories and furnishings as the sophisticated shade with cool overtones works best as a backdrop. And, as for the trim? Instead of white (which Greenberg has seen plenty of over the last few years), try Classic Gray OC-23, he says. Part of Ben Moore’s Off-White Color collection, it works beautifully alongside Metropolitan on woodwork. Debsan encourages homeowners to see for themselves with its Rent-a-Quart program. This “try before you buy” paint program takes the risk out of experimenting with color as customers can take home samples to test out in their own living spaces. SPECIAL OFFER FOR FRIENDS OF BDG: Mention Boston Design Guide at Debsan for a "buy-one-get-one" offer. Ben Moore quart rental are $4 per color.